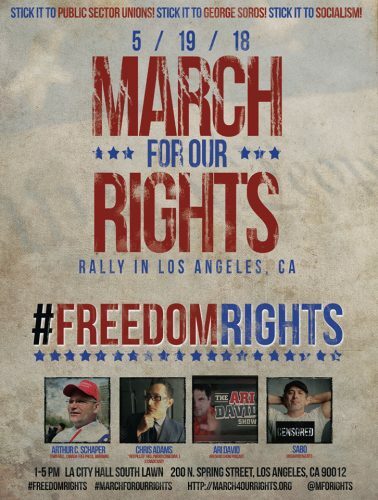 May 19th Nationwide “March for Our Rights” rallies are powered by Freedom Rights, an advocacy group aimed to protect the US Constitution and The Bill of Rights. California events will be held in Downtown LA City Hall South Lawn and Bakersfield. Los Angeles, United States - May 16, 2018 /MarketersMedia/ — The grassroots movement was born of a video recorded by Sybele Capezzutti, a single mom and legal Brazilian immigrant of 30 years. Sybele was irritated and disappointed over the Congressional shut down during DACA negotiations. Her Facebook Live video went viral reaching viewers all over the world, featuring her passionate plea for Americans to stand up for their rights. Bryan Turner, an ordained minister in Kentucky with a heart for prison ministry, reached out to Capezzutti and asked, "What can I do?" Today many thousands are asking "what can we do" and looking to their committed leadership team for answers. Freedom Rights announces its first national event, March for Our Rights, on May 19, to expose and oppose the infringements on the constitutional rights of the American people.The first and second amendments along with various others have been greatly infringed, especially during the divisive years of the Obama administration. The scope of government overreach and abuse of power has increased dramatically all over the country, especially in California. Big business and powerful lobbyists have been given special treatment and consideration, while small and entrepreneurial enterprises have been crushed under cumbersome regulations and taxation. The authority of parents to impart values on their children has been greatly diminished by the powerful Department of Education. California has exhibited a pattern of restricting Conservative/Libertarian media and college campuses are no longer supportive of free speech. Instead, they have become intolerant of any ideals that do not match up with their own agendas. When asked about the reasons behind creating this event, the host of the event said, “We hope to provide a counterbalance of organized Americans to combat the rise of a bloated and overreaching government. We march and rally so the individual remains protected, but we will do more". The father, grandfather and small business owner added, "Going forward we will vet political candidates. We will stand with those who support the Constitution and expose those who do not."